Here at Dachshund Delights, we try to bring you the best in historical and news-related items with a dachshund connection. And sometimes we have to establish that connection by a circuitous route. Occasionally, by a very circuitous route. May 13, 2014, is the centenary of the birth of Joe Louis, arguably America's first African-American sports hero, and a man who was not only a boxing champion, but who also effectively integrated the world of professional golf. To call Louis' origins humble is almost to overstate the case. The grandchild of slaves, he was born in a settlement in Alabama too poor to even have an official place name. His family moved north to Detroit to escape the Klan, but soon the Depression struck, and jobs were scarce for everyone, doubly scarce for non-whites. Over the objections of his mother, and largely behind her back, Louis began to box. He was strong and fast and smart, and after rising through the Golden Gloves ranks, he became a professional just before his 21st birthday. Can you name the current heavyweight boxing champion of the world? Can you name the champion in any weight category? Didn't think so. So it may be hard for you to imagine a time when boxing was followed avidly and when its champions were near the top of the sports prestige pyramid. Joe Louis fought in that time, and he was a champion of champion. To this day, no one has successfully defended the title as often as he did. But if most people remember Joe Louis for anything, it's for the two fights – in 1936 and in 1938 – he had against Max Schmeling of Germany. The 1936 fight was not a title bout, but it became even more significant than that. It was a fight between a black man from America and a white man from Hitler's Germany. Schmeling was in decline in 1936, but he trained hard and he studied Louis' every move. Louis, on the other hand, was overconfident and slacked off. And in the 12th round, Schmeling laid him on the canvas for the first knockout of his career. The African-American community was devastated, and Hitler crowed long and loud. The following year, Louis managed to win the championship, but he stated publicly that he would not recognize himself as champ until he had beaten Schmeling. Louis didn't make the same mistake twice. He trained extensively. And, of course, Schmeling was almost 33 by this time. The fight lasted two and a half minutes, and it's a miracle that it went that long. Louis rained punches like a machine; Schmeling only got off two punches, and he was knocked down three times. At last, Joe Louis was the champion he wanted to be. Now let's put in a word for Max Schmeling. That's him in the picture at the left, holding his team's mascot, Cilly the dachshund. Many, Hitler included, took Schmeling's first victory as a vindication of The Master Race. Schmeling didn't. He was never a member of the Nazi party, he snubbed Hitler, he had a Jewish manager, and, it turned out later, he rescued two Jewish boys from Kristallnacht and got them to safety at great risk to himself. It is believed that he had planned to defect to the U.S. after his fights. The Gestapo apparently believed that, because they made sure that his wife and mother were held back in Germany while Schmeling was over here. Having been cheated out of a lot of his money by unscrupulous promoters, and having been overly generous with his family, Joe Louis was in serious financial troubles in the latter years of his life. 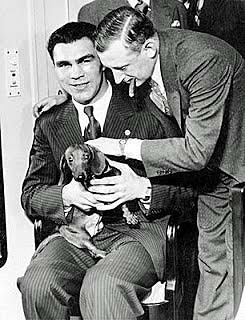 Max Schmeling gave him money to pay off some of his debts. When Louis died at the relatively young age of 66, Schmeling paid for his funeral and was one of his pallbearers. We salute Joe Louis, a hero and a man of great courage and honor. We don't know that he ever met Cilly the dachshund, but we choose to think that they would have liked each other.